The leaderships of International Society for Civil Liberties and the Rule of Law (Intersociety) and the Southeast Based Coalition of Human Rights Organizations (SBCHROs) have, again, observed with deepest dismay the recent militarist and undemocratic rulings of Hon Justice Binta Murtala Nyako’s Federal High Court; leading to denial of bail and right to open and public trial of Citizens Nnamdi Kanu, Benjamin Madubugwu, David Nwawusi and Chidiebere Onwudiwe. We totally disagree with the findings or rulings of Hon Justice Binta Murtala Nyako and grounds upon such militarist and undemocratic findings were made. We hold, in line with the provisions of the 1999 Constitution of Nigeria, that that a citizen accused by the State in the open of committing crime of whatever magnitude in the open, must also be tried in the open court and that he who alleges must also prove; that security operatives as witnesses are not more exposed to security threats, if any, than other witnesses who are not security operatives; that Nigeria is not a despotic and militarist republic by its current international status and must not be allowed to be made one by the likes of Retired Gen Muhammadu Buhari, his SSS and hired and conformist members of the Bench; and that any form of secret trial or proceeding unknown to the mandatory sections of the Fundamental Human Rights Chapter of Nigeria’s 1999 Constitution; must be roundly rejected by all Nigerians at all times. As Nigerians and members of the international community are aware, Citizens Nnamdi Kanu, Ben Madubugwu, David Nwawusi and Chidiebere Onwudiwe have been in indefinite detention or custody of the State Security Services (SSS) since July and October 2015; and June 2016 respectively, over allegations by the Buhari Administration that they committed political crimes, which the Administration tagged “treasonable felony”, “terrorism” and “unlawful of possession of (un-prohibited) firearms”. The four Citizens are chieftains of the Indigenous People of Biafra (IPOB); a non violent self determination and indigenous rights advocacy movement, advocating for the group and citizen’s rights of the Igbo and other Southern Ethnic Nationalities in Nigeria. IPOB and its indigenous rights campaigns are recognized by the Economic and Social Council of the United Nations or ECOSOC under the UN Declaration of the Rights of the Indigenous Peoples; strictly on account of its nonviolent methodology. According to Buhari Administration, Citizen Nnamdi Kanu committed “a treasonable felony” (i.e. 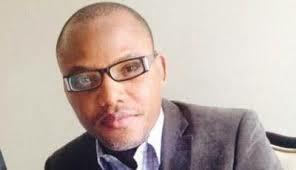 seeking to violently or militarily unseat his government) by operating Radio Biafra London (RBL) with associated agitation messages for a separate statehood and self determination; that Chidiebere Onwudiwe is “a terrorist” by “being caught in Enugu studying how to manufacture Improvised Explosive Devices (IEDs)”; that Benjamin Madubugwu is “a possessor of unlawful firearms” by “being caught possessing two Pump Action guns without a license”; and that David Nwawusi is “a reasonable felon” by “being linked to illegal importation of radio transmitters for transmission of separatist and hate messages ”. By the plain language of the Black’s Law Dictionary: Ninth (9th) Edition 2009; the four nonviolent Citizens under reference are nothing but State’s victims of Prosecutorial Vindictiveness; defined by the globally most respected and widely used law dictionary as the act or an instance of intentionally charging a more serious crime or seeking a more severe penalty in retaliation for a defendant’s lawful exercise of a constitutional right. We wish to quickly recall that the Hon Justice Binta Murtala Nyako’s Federal High Court sitting in Abuja, Nigeria had on December 1st and 13th 2016 respectively, denied Citizen Kanu and three others bail and deprived them of their constitutional and international rights to be tried and heard in public or openly conducted court proceedings. With the two militarist and undemocratic rulings of Hon Justice Binta Murtala Nyako, mentioned above, it has become clearer that fairness and openness have departed the criminal prosecution of Citizen Nnamdi Kanu and three others. Their prosecution has also changed to persecution with strong circumstantial evidence of convictable verdict already prepared waiting to be delivered at the end of their makeshift trial. Others: 5. Citizen Sunday Chukwuka Obasi was arrested; shot at his two legs and thrown into indefinite detention by SSS since August 2016 without any court arraignment or trial till date; a period of over four months; 6. Citizens Ikechukwu Ugwuoha, Asochukwu Ugochukwu, Sunday J. Okafor, Ekene Onuoha and Joseph Okorie (Ogbuawa) were arrested and thrown into indefinite detention by SSS since August 2016 without any court arraignment or trial till date; a period of over four months respectively. In all these, processes and procedures used by the Buhari Administration in arresting and detaining the eleven nonviolent citizens grossly run contrary to the Fundamental Human Rights Chapter of Constitution of the Federal Republic of Nigeria 1999 as well as the African Charter on Human and Peoples Rights of 1981 and the UN Covenant on Civil and Political Rights of 1976, all ratified by Nigeria in 1983 and 1993 respectively. Other persecutorial elements foreclosing fair and open trial as well as fair justice in the criminal prosecution of Citizen Nnamdi Kanu and three others are: total disregard and disobedience of several court pronouncements for the enforcement and protection of the detained Citizens’ legal and constitutional rights such as court bails; mindless killing of over 250 Pro Biafra campaigners and attempted murder of over 300 others by army, police and navy; languishing in prisons and other detention centres across Nigeria of over 150 Pro Biafra Campaigners; criminalization and stigmatization of IPOB’s nonviolent campaigns by the Buhari Administration and its killer-security forces; high executive meddlesomeness in the judicial proceedings of the detained citizens; SSS continued onslaught and crackdown on nonviolent and unarmed IPOB and other innocent Pro Biafra campaigners by way of indiscriminate arrest at odd hours or times of blue law and their long detention without trial; enforced disappearances of scores of IPOB activists; recent militarist and undemocratic rulings of Hon Justice Binta Murtala Nyako’s Federal High Court and associated scripted proceedings; to mention but few. As we had earlier held, the ongoing criminal proceedings of Citizens Nnamdi Kanu, Ben Madubugwu, Dave Nwawusi and Chidiebere Onwudiwe have disastrously moved from Prosecution to Persecution in all its ramifications; and it may most likely be safe to declare same as political trial and non-judicially triable! Further, by the plain and unmistakable language of the Black’s Law Dictionary: Ninth (9th) Edition 2009; Prosecution is a criminal proceeding in which an accused person is tried or a conspiracy trial involving trial of more than one person over alleged commission of same offence. The respected global law dictionary further says that the opposite of Prosecution is Persecution; which it defines as a political or judicial violent, cruel and oppressive treatment directed towards a person or group of persons because of their race, religion, sexual orientation, politics, or other beliefs. The globally respected and widely used law dictionary also provides the following terms and their precise definitions: Criminal Trial: A formal judicial examination of evidence and determination of legal claims in an adversary proceeding; Closed Trial: A trial that is not open to the public usually because of some overriding concerns such as a need to protect a child’s anonymity; Open Trial: A trial that is open to the public; Nemo Judex In Sua Causa: No one or no man should be a judge in his own case or cause; Audi Altarem Partem: Let the other side be heard as well; or nobody should be condemned unheard; Fair Trial: A trial by an impartial or disinterested tribunal in accordance with regular procedures, especially a criminal trial in which the defendant’s constitutional and legal rights are respected. Hearing: A judicial session, usually open to the public, held for the purpose of deciding issues of facts or of law, sometimes with witnesses testifying; Fair Hearing: A judicial or administrative hearing conducted in accordance with due process; Due Process: The conduct of legal proceedings according to established rules and principles for the protection and enforcement of private rights, including notice and the right to a fair hearing before a tribunal with power to decide the case. Source: Black’s Law Dictionary: Ninth (9th) Edition 2009. Constitutionally speaking, the express or literal meaning of (optional or exceptional) secret or non public trial, provided under Section 36 of the 1999 Constitution of Nigeria is that it is optional and not mandatory. What is constitutionally mandatory is the trial of accused citizens in open and fair court in Nigeria. In the context of optional or exceptional secret trial, which Hon Justice Binta Murtala Nyako crookedly interpreted, every accused citizen in Nigeria is also left with a constitutional option or choice to accept or reject his or her trial in secrecy or outside open court particularly if he or she reasonably suspects that he or she shall not get fair hearing and fair trial under such a militarist circumstance. It is on account of these, therefore, that we strongly advise the Defense Counsel or Legal Team of Citizens Nnamdi Kanu, Benjamin Madubugwu, David Nwawusi and Chidiebere Onwudiwe to critically and strategically rethink and re-jig. That is to say that time is here, apt and ripe for them to evaluate and re-evaluate the ugly goings on so as to thwart and scuttle nimbly and courageously all attempts and efforts of the Buhari Administration to “rot “ their “probono” clients in jail at all costs. The rethinking and re-jigging under firm advocacy demand of ours must incorporate the reasonable opinions of their “probono” clients and other leaders of the IPOB. The Pro Biafra nonviolent struggle led by IPOB and others has indeed entered advanced and critical stage and requires commensurate lawful and legitimate response from the defense team and the IPOB leadership in general. As the Defense Legal Team are aware, there are no guesswork, gambling, sentiments and rigmarole in criminal adjudication and law; just as orbita dicta, not ratio decidendi, are immaterial in judicial findings. Where it is elementarily clear to the defense legal team that the Hon Justice Binta Murtala Nyako’s proceedings; likewise other subsequent proceedings have been brutally operated upon by the Buhari Administration and laid outside the confines of open and fair trial, fair hearing, due process, fair prosecution and fair findings; it is our strong and informed advice that the defence team and their “probono” clients should publicly back out or withdraw from the makeshift trial until the reverse becomes the case. On no account must Citizen Nnamdi Kanu and three others be allowed to be convicted and despotically jailed by the Buhari Administration under the prevailing biased, militarist and undemocratic circumstances. It is far better to remain in despotic custody without any form of trial than to be convicted and sent to jail under prosecutorial and procedural vindictiveness and despotism. IPOB, on its part, should remain sticky to its nonviolent stand at all times, in spite of State provocations and persecution, but must add more techniques, tactics and strategies in the overall midwifery of its nonviolent campaigns. Part of these is the need to engage in strategic global campaigns to draw the attention of respected international governments, institutions and personalities over intensified persecution against it by the Buhari Administration. Its nonviolent campaigns must be taken beyond the confines of surface approach; synchronous and asynchronous web conferencing and radio/web jingling and sarcasms; to strategic and critical approaches grounded in information numeracy and literacy and letters of the law. On our part, we renew our earlier call and reminder to the authorities of the Human Rights Watch, USA and their research team in Nigeria that the world and Nigerians still await their reportorial position on indiscriminate killing and maiming of unarmed and nonviolent Pro Biafra Campaigners by the Buhari Administration since July/August 2015 as well as indiscriminate arrest and long detention without trial of hundreds of IPOB members and supporters by SSS, police and soldiers. To convince Nigerians and international watchers that its Nigerian research team headed by a female South-westerner; are not caught in the web of ethnic bias, the world respected rights watchdog should toe the commendable line of Amnesty International, UK, just as it (HRW) did in the Zaria Shiite Massacre of December 2015.